This thread is for anyone who wants to show how they've Feng-Shuied their cockpit to ease hypermiling. When I started ecomodding a while back I kept wondering about how and where to attach all the buttons, switches and LEDs in a way that is both functional and wife-approved. Luckily, the CD changer under my radio was kaputt, so I removed it to (1) use less electricity, (2) keep it out of the reaches of anyone who might want it. (Actually, I don't mind someone taking it, but I don't want to replace my window in the process.) So I used the space under my radio for my ecomodding console, and now that it's more or less done I'd like to show it off so that others may get some inspiration. I used the carcass of a dead radio to make sure everything would fit nicely. An on-off-on switch for the DRLs (on-off-auto). There is also a small blue LED to signal when the DRLs are on, and a larger blinking red LED that was supposed to signal when the radiator fan kicked in, but now only signals when the engine kill button is pressed. There is still room for another two switches when the time comes. The insides (pardon the mess) are wired through connectors which allow the whole box to be easily taken out of the car (and worked on in a warm, dry place). I plan to get the mess cleaned up and add a small diagram of which wire show go where, in case my failing memory gets the better of me. My ScanGauge rests in on the ashtray, under which is the OBD socket. I'm thinking about a semi-clear piece of plexi, hinged at the top, to cover the buttons from curious eyes and fingers when I'm not driving. And here's the start/stop button in action. Last edited by Piwoslaw; 11-02-2010 at 10:41 AM..
May I open a "Show off your ugly cockpit" thread ? megane : thread - kill switch. ...how does that saying go? "...NEATNESS is next to..."
Oh, c'mon Groar. First the Uglyback, then the Uglycover and Uglyteeth, now the Uglycockpit. Where is your self esteem?? Anyone want to play spot the VAG part ? The wheel is an obvious one... Note I drive on the correct side so the wheel is on the right, and mods seem to be at a minimum. But wait, there is an SG2 poking its head over the steering column. Why yes, there it is. Note that the SG supplied sticky pad has long since given up so I replaced it with one intended to stick number plates onto the outside of the car, but as you can see the toxic state of my interior has made it fail. No it wasn't as late as the clock suggests, I must work out how to change it for GMT after BST. Yes I did take a Dremel to my dashboard to get the wiring to fit. I actually got fed up of banging my knee on the door to this cubby hole. I did miss out a pic of the insulating tape holding this cover closed, but you get the idea. Here's my toggle switches, which fill space formerly occupied by blanks in all North American Insights. From left to right, it's fuel injectors, clutch switch (assist/regen disable), DC/DC converter, and MIMA enable. The only one I use with any frequency is the one on the far left, which enables EV mode, forces DFCO, or just does light anti-theft duty. 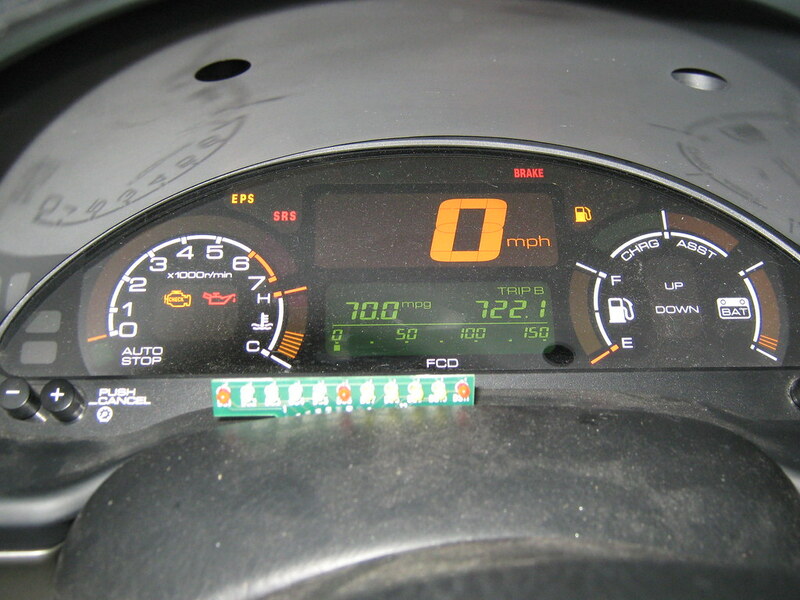 This is the only picture I have of my MIMA display, which is just eleven LEDs wedged between the steering cowl and the dash. Pictures of my ScanGauge, MPGuino, and BCMGauge will have to wait until the latter two are installed. 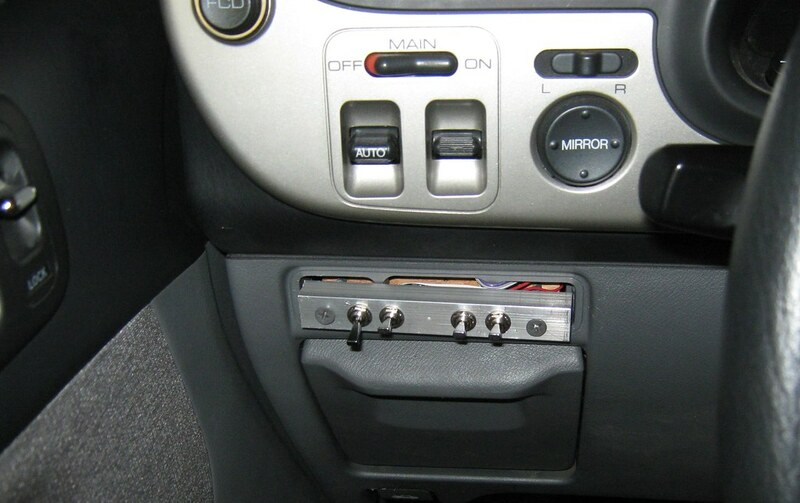 I also have a momentary kill switch on the gearshift and a MIMA joystick + 2 buttons zip-tied to the handbrake lever. LOL, Robert you need some gas and juice in that thing. LOL, you beat me to it! !